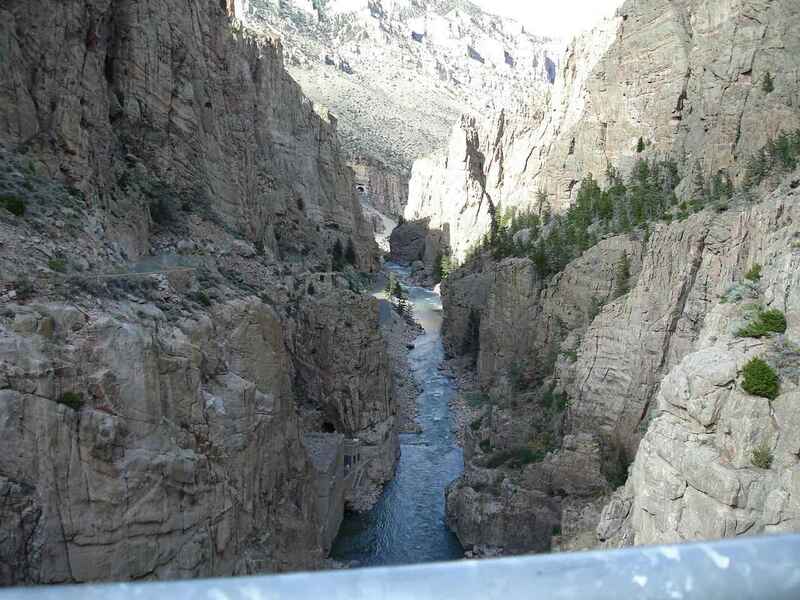 There are a lot of interesting things to do and see in Cody, Wyoming. This is the town that Buffalo Bill Cody created in 1901. A symbol of the West, he was also a great showman.. 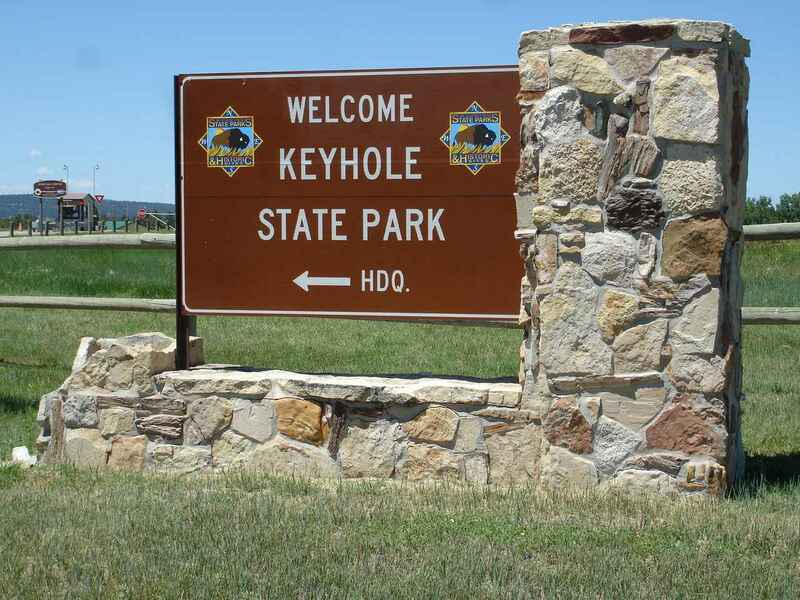 When he passed through this area in the 1870's he was impressed by the possibilities and the proximity to Yellowstone. After an attempt at farming , Cody realized that managing water in this section of Wyoming would require more money and effort than he could manage. 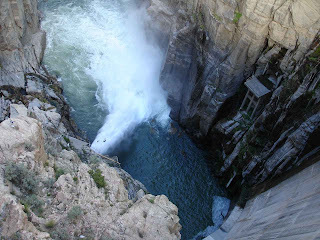 He encouraged the federal government to become involved and eventually the government decided to build this dam. When finished in 1910 it was the tallest dam in the world. Later, in the 1970's the dam was raised creating a much larger volume of water for the irrigation efforts downstream. This area only receives a few inches of rain water a year. 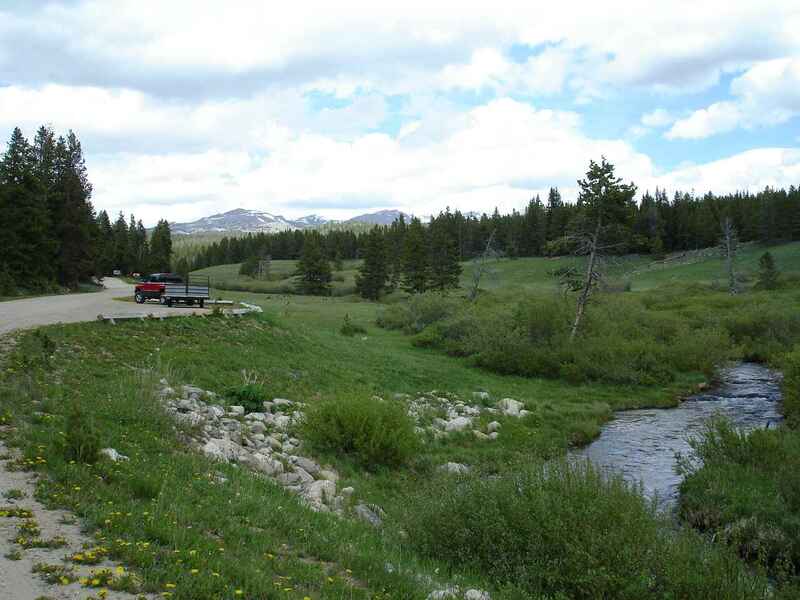 But there is a huge runoff of snow melt each spring and summer. Controlling that runoff enables 93,000 acres of beans,alfalfa,oats,barley, and sugar beets. It didn't take long for the largest dam title to be shifted elsewhere. Think Hoover Dam among others.. Still very impressive. 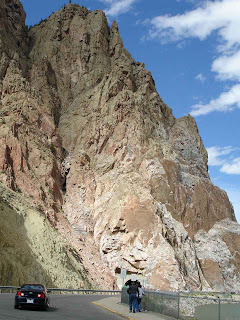 This tall wall of rock is also the entrance for the first of three tunnnels leading into Cody. 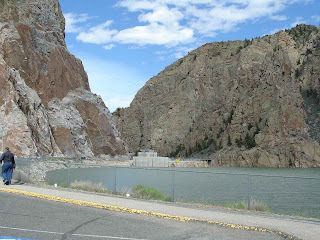 Looking over the dam, you see there is plenty of water heading down to the irrigation pipes. And also towards the hydro power plant about a mile downstream. 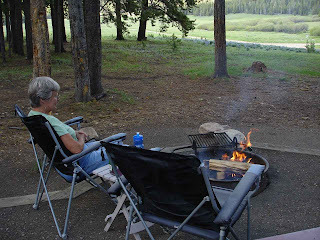 We did not spend a lot of time in Cody, but we could have. The town seemed well planned and very inviting. We did find the local walking paths and took advantage. 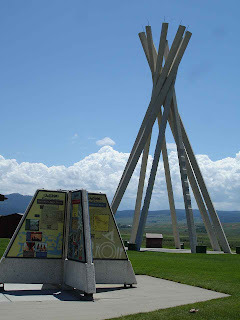 At another time, we might want to visit what is considered an excellent museum in town, The Buffalo Bill Museum, as well as an ongoing night rodeo. We did take advantage of an excellent store called Cody Meat. They had excellent cuts of local Black Angus as well as other meats. Our tiny charcoal grill was quite happy!! 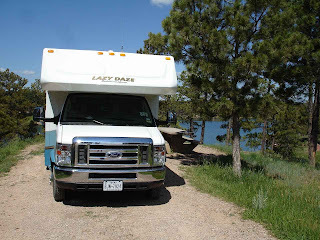 We followed a southern route out of Cody, following Route 16 into the Bighorn National Forest. 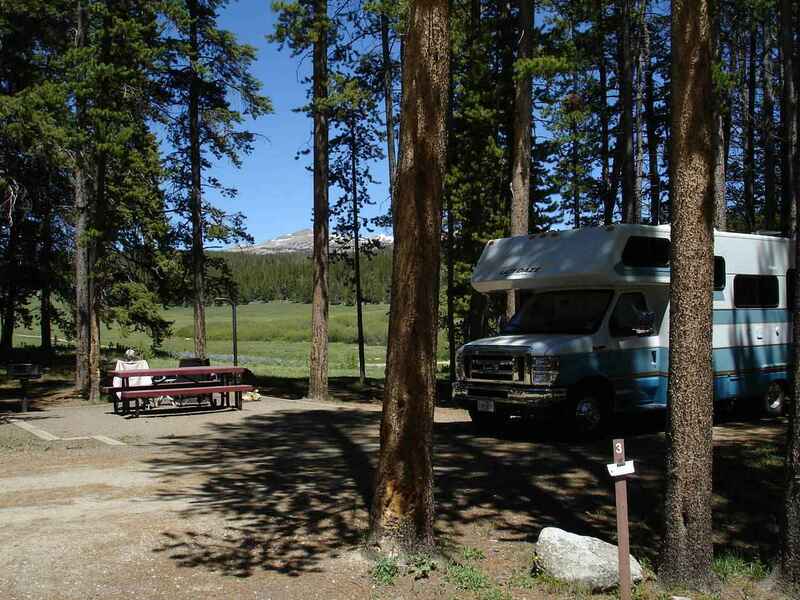 So many choices of campgrounds along this mountain route and we chose Sitting Bull. 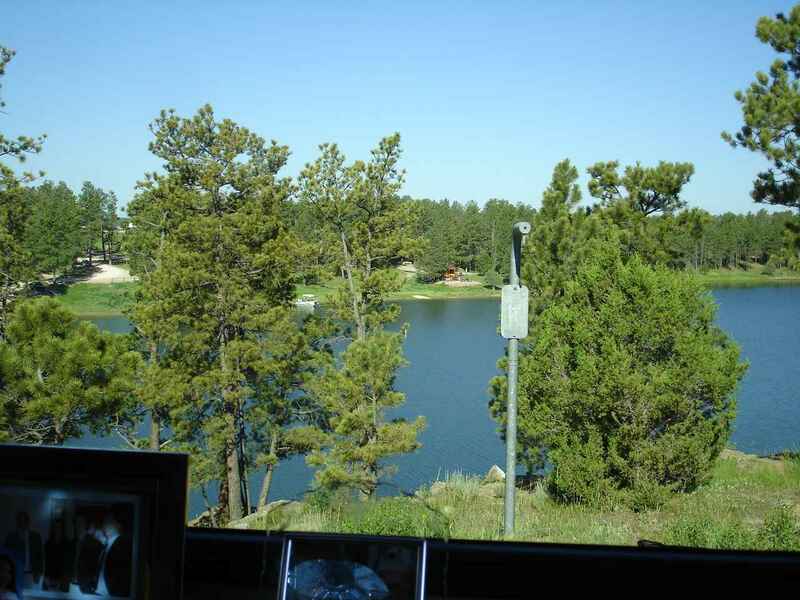 It sits at 8600 feet altitude across from a good sized mountain lake. 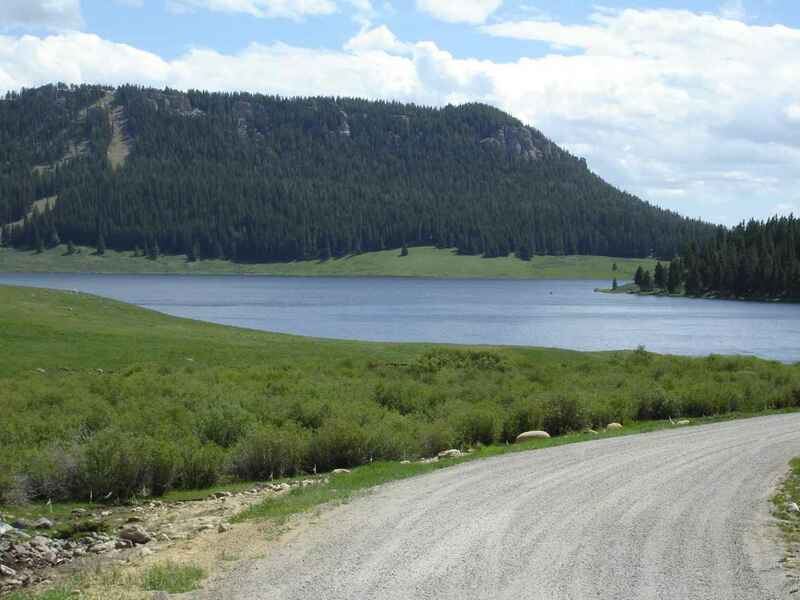 This southern route still climbed well over 9,000 feet. But we were warned not to try Route 14A in the north which was supposedly extremely steep with many hairpin turns. 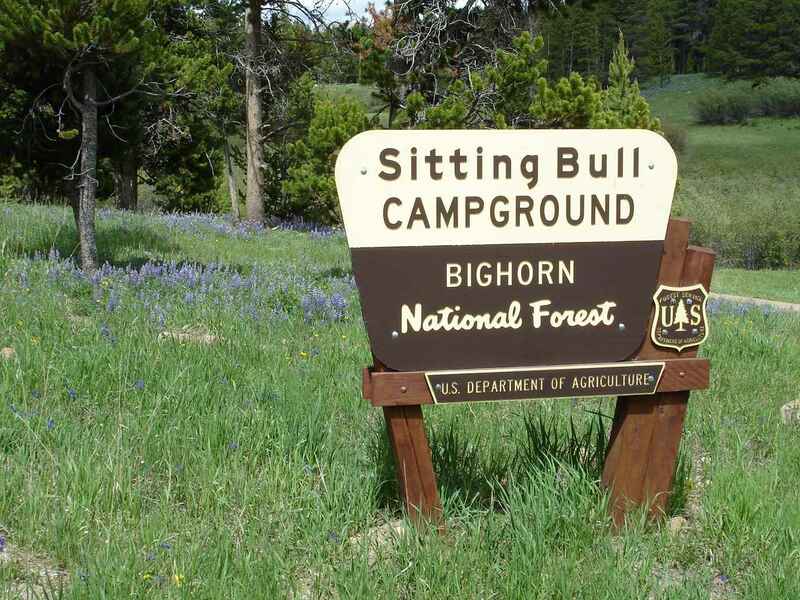 As soon as you turn in for the 1 mile road to the campground, you see the northern snow covered Big Horns. A fast moving mountain stream flows by the campground down to the lake. We walked down to the lake later. There were a few fishermen and some youngsters enjoying the fresh water. There was a mother moose and her young calf that would feed here most mornings and evenings. Kind of matches Lady Blue? 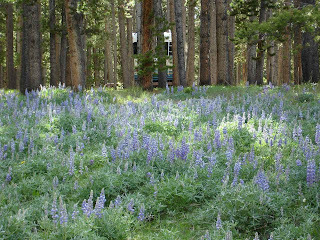 There were many field of these Lupines?. 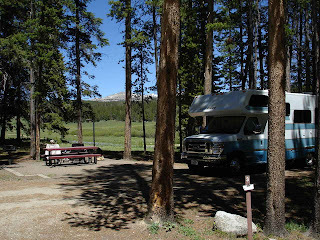 Nestled in the pines, we did not have cell phone, internet, or TV signals. Absolutely! 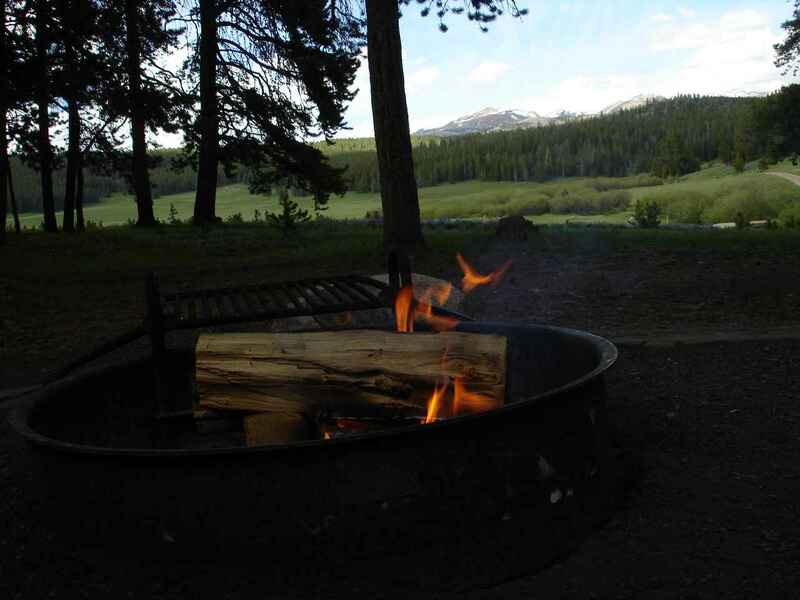 Perfect spot for a campfire. 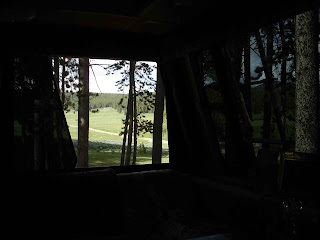 By the way, for $8.00 per night, this was a very large site. When we arrived, it had been raked and groomed by the very friendly and attentive hosts. 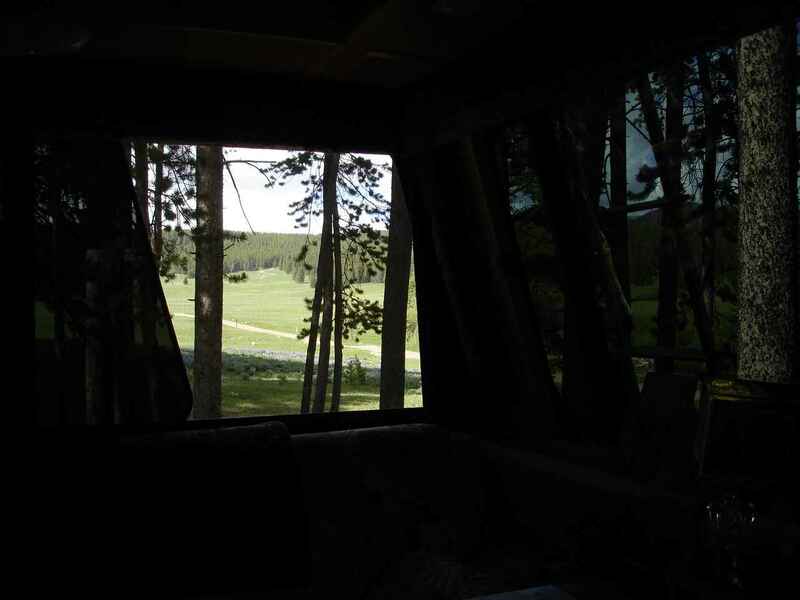 The view from inside Lady Blue is of an ATV road as well as the stream. An occasional deer would browse the meadow. 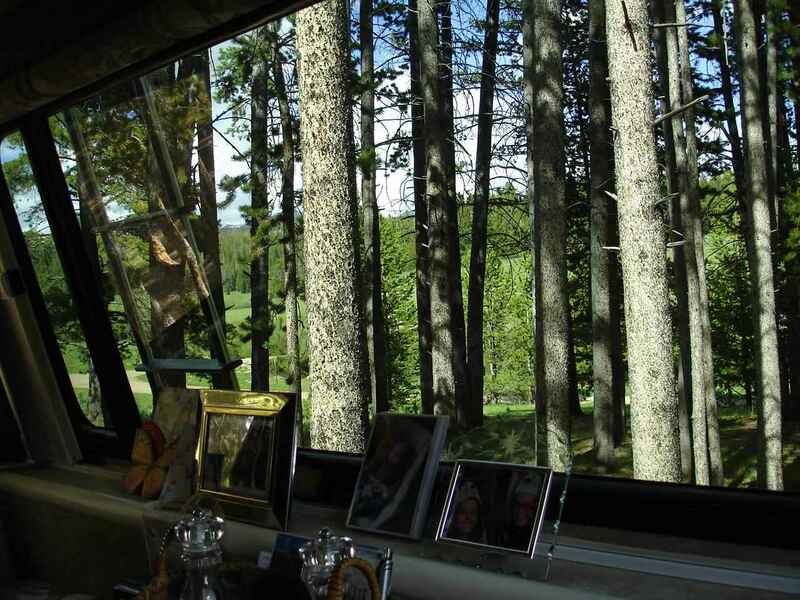 Out the back window, lots of pines. We spent a lot of time by our fire, enjoying the view and the peace and quiet. This road through the mountains had a number of parking spots for snowmobiles and lots of snow fences for the winter. 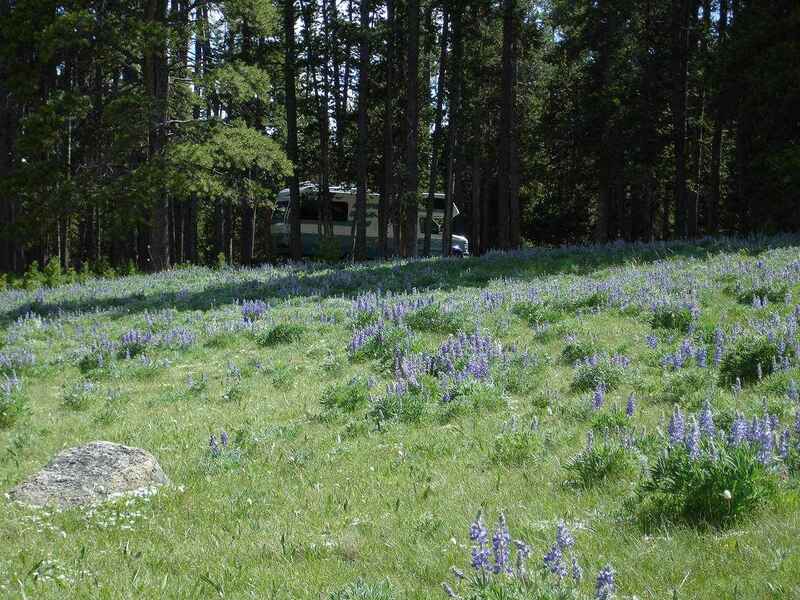 Many signs of elk and deer along the way. Sitting Bull National Forest is definitely added to our favorites list. 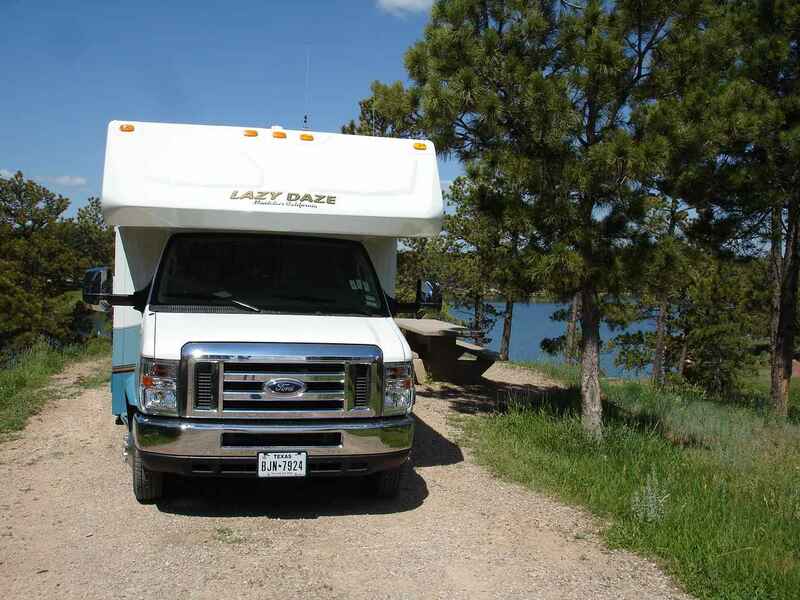 Once down out of the mountains, we take a chance on a state park at a large lake. 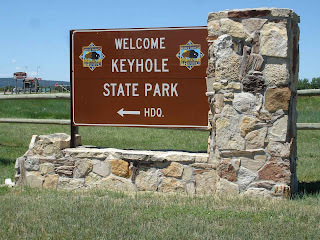 Keyhole State Park is located in Moorcraft, Wyoming beside Keyhole Reservoir. 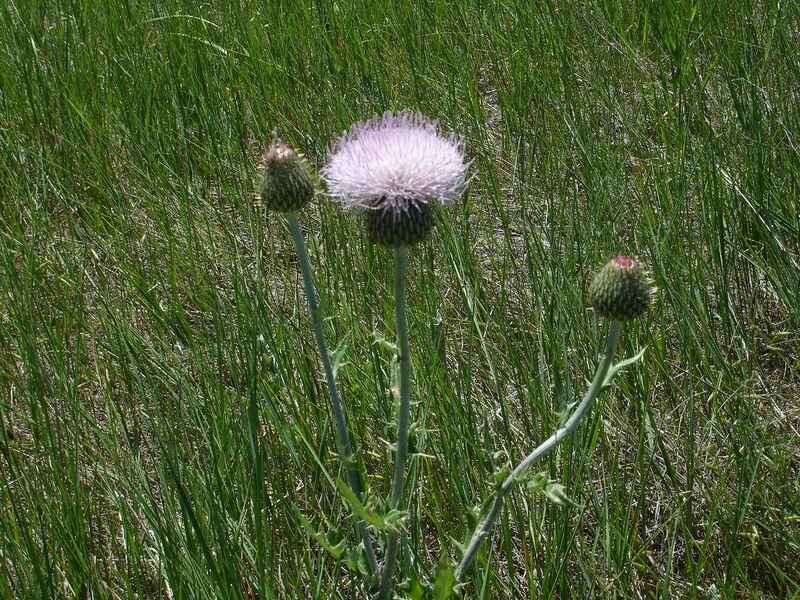 Along the field, we found a large crop of bright pink thistles. 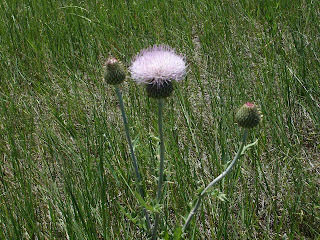 There were a number of divisions within the state park. Also included was a 6.2 mile walking or biking trail. Since we are without bikes for the time being, we hiked for a few hours. Yes, That's Lady Blue on the top of the opposite ridge. So different from Sitting Bull, but so nice in its own right. 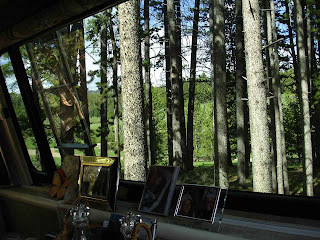 The fields , campsites, and gravel roads reminded us of a number of spots in northern Maine. We were surprised at the number of very large and very nice boats around the lake. Even more surprised that they all were kept to a very low speed and wake. 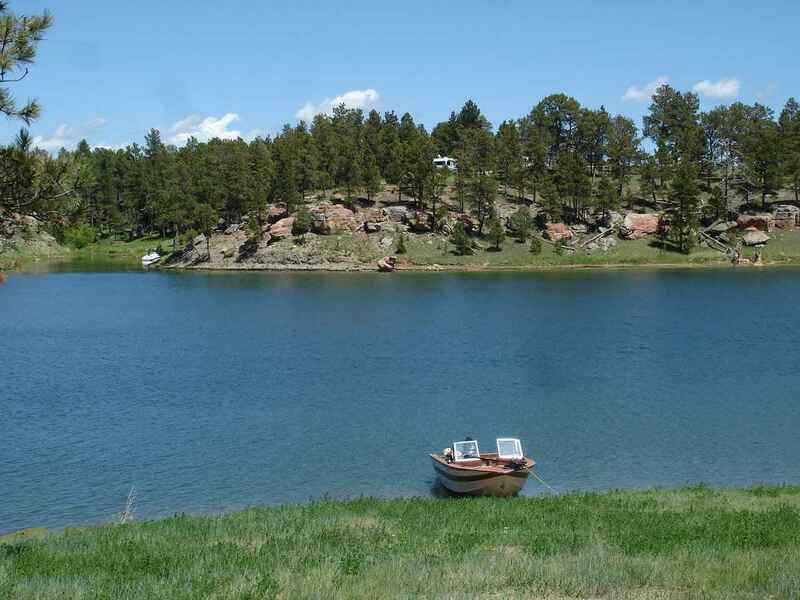 Some very serious fishermen were about, The campground host reported a catch of about 22 fish for one afternoon. Lady Blue approved of this campground as well--though quite different from Sitting Bull. 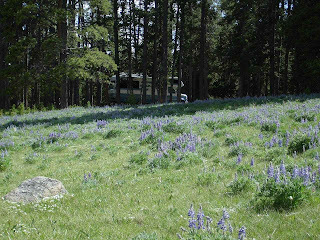 Most sites here were dry camping(no hookups), but there some electric and water sites in different areas. 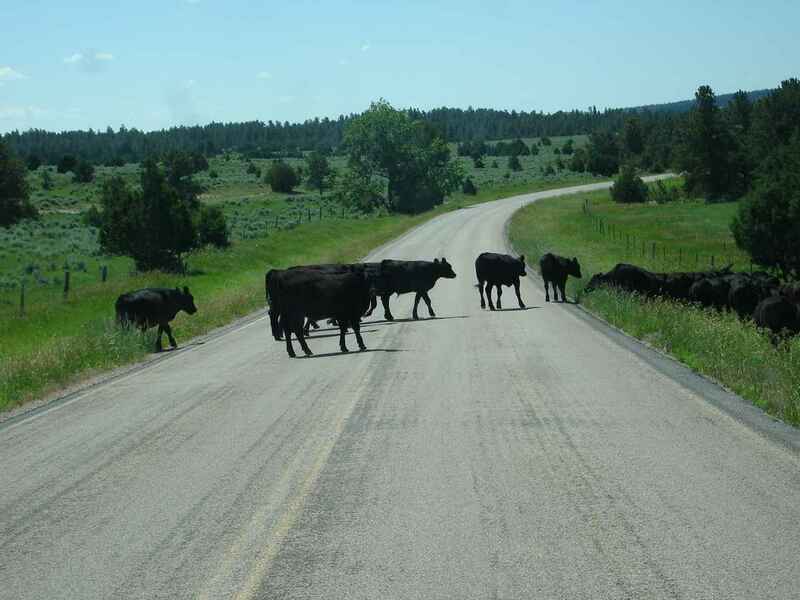 On our way out of the park, we are reminded that this area has many sections of road that are designated " open range". Somehow, this particular section had barbed wire fences on both sides of the road, so the cattle had nowhere to go except on the road. Eventually some park rangers headed them back to their pasture. We were reminded of those wonderful steaks from Cody!!! In no time at all, we are entering South Dakota. 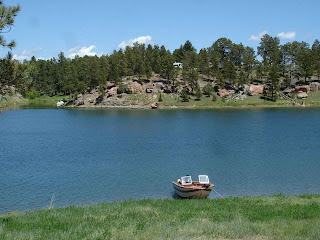 A rural town called Sturgis. I'm sure some of you might remind me that this place is quite busy in August. Some of you might even say that it becomes the motorcycle capitol of the world for a short time. Right now, it's very quiet.